Oil-Free, Gluten-free Mushrooms. 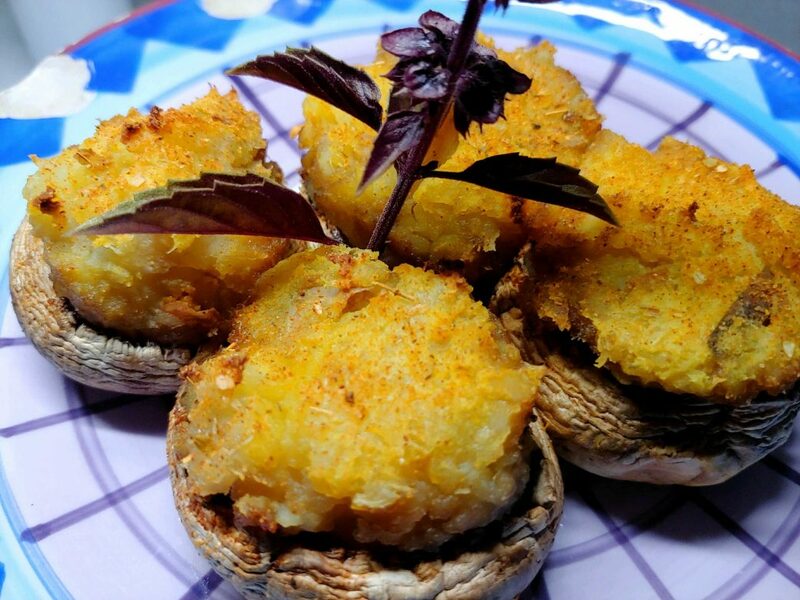 This unique variation of stuffed mushrooms uses lemon juice & balsamic vinegar to broil or bake the mushrooms. The filling is made from boiled then mashed sweet potatoes with the skin, garlic, thyme, and oregano. *1 Large sweet potato will fill approximately two dozen medium sized mushrooms. After thoroughly washing the potatoes, keep the skin on and slice into 1” cubes. Boil them for approximately 15 minutes. Drain. Put them back into the pot and mash with the rest of the ingredients. Preheat your oven or toaster over to 425 degrees. Remove the stems and using a small spoon scoop out the insides. I like to add the insides back into the mash. Before making your filling, fill a bowl with cold water and place all the prepped mushrooms in the water. Let them absorb some water. This is ok and they will not be mushy once cooked. Spoon in the mashed sweet potatoes generously. I like to overfill them. In an oven-safe pan or tray add 3 Tbsp spoons of lemon juice. The equivalent of 1 juiced lemon. Add 1+ Tbsp of balsamic vinegar. You can add more of less of these ingredients and also experiment with flavorful liquids you enjoy. Place the filled mushrooms on the tray and bake for 30-40 minutes. You can also broil them for 20 minutes. When the tops start browning they are done. In this example, I topped them with a salt-free Cajun spice blend. Why boil vs baking? It is healthier. Here is a link explaining why.